One of the great tragedies in the evangelical church of today is that it has largely forgotten one of its great heroes from the evangelical church of yesterday. 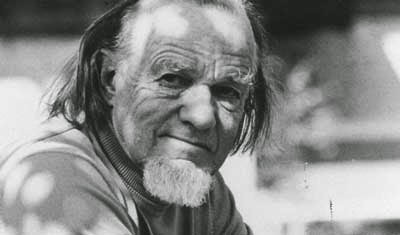 One of my heroes of the faith and someone who has profoundly affected my thinking is Francis Schaeffer. Just how influential was Schaeffer? If you find yourself opposing or protesting the rampant abortion of our culture, you probably owe your awareness of the issue to Schaeffer. If you are familiar with the term "Christian worldview", you likely have Schaeffer to thank. If you self identify as a reformed evangelical, along with other incluences such as R.C. Sproul, J.I. Packer and John Piper you likely have Francis Schaeffer to thank. If you hold firmly to the doctrine of the inerrancy of Scripture, probably much of your reasoning can be traced back to Schaeffer's defences of the Bible. If you believe there comes a time in the culture wars where Christians may have to take the stand of civil disobedience, you are following Schaeffer. If you believe that evangelicals can and should present our faith and worldview through the arts (including film), and that we should do art better than anyone else because we know the great and first Artist, you have Schaeffer to thank. And if you believe that love and kindness as well as strong intellectual reasoning are all part of the task of apologetics, you likely got that blend from Schaeffer. And this is only part of his ongoing and pervasive legacy. Certainly he did not stand alone in all this, nor was he the originator of any of these concepts or practices, but Schaeffer was a hugely persuasive popularizer of these things through his books, lectures, sermons and films. He saw so clearly the effects of Secular Humanism, Pragmatism, Relativism and Postmodernism within modern society and with the clear gaze of a prophet he told the church of his day just where it would end up if it didn't recognize and reject these things as incompatible with the universal Lordship of Jesus Christ. [Oh yeah, if you hold to the universal Lordship of Jesus Christ over all of thought and life, you probably also owe that to Schaeffer.] God used him powerfully in his day and, thanks be to God, even though so many have forgotten about him or have never even heard of him or are unfamiliar with his work, there are some around who, while not perhaps agreeing with every single thing he said or did, still carry on his legacy and his Christian cultural project in their own ministries. The truth of Christianity must be demonstrated both intellectually and practically through a life of faith.